‘Green PAC is the hub for green (fibre) chemistry in the North East Netherlands,’ says the organisation on its website. It initiates and facilitates business driven knowledge development. Green PAC (shorthand for Green Polymer Application Centre) is an initiative of the universities of applied sciences Stenden in Emmen and Windesheim in Zwolle. The biocomposite bascule bridge at Emmen Zoo, with Rob Voncken, Green PAC director. 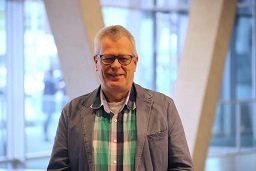 ‘Our main fields of competence are green polymers, biobased or biodegradable, and the circular economy,’ says Jan Jager, professor in sustainable polymers at Stenden University of applied sciences. 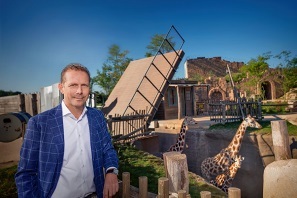 The showcase of Green PAC’s competence is the biocomposite bascule bridge in the entirely renewed WILDLANDS Adventure Zoo in Emmen. A bascule bridge, for it spans a dry moat through which giraffes pass. The bridge floor is made of a bioresin reinforced with natural fibres; lighter than steel, and comparable in its properties with glass reinforced resin, but with a much lower environmental footprint. Their new project is a bridge for cyclists in Leeuwarden, made of a biobased composite as well. Emmen positions itself as a centre of polymer competence, and in that, Stenden university plays an important part. ‘Business driven’ is the keyword for new initiatives of universities of applied sciences – much more dedicated to practical applications than universities proper. ‘We do applied research together with businesses,’ says Jan Jager, ‘in particular in the areas of yarns and fibres, (biobased) composites and polymers, and polymer recycling. Much expertise has survived in the region, a heritage of the old AKU, later AKZO factory at the Emmtec industrial site. AKZO left, but in its place came other companies, big and small, like Teijin, DSM, Senbis Polymer Innovations, Cumapol and Sunoil Biodiesel. Of course, research is part of our curriculum. Green PAC now offers a dual master course in Polymer Engineering. The graduate specialists have an expertise in sustainable polymers and can perform applied research into their properties. They can use this expertise for devising production processes and for polymer technology innovation.’ Another branch of Green PAC, the iLab, provides support to start-ups in the development, production and marketing of innovative polymer products. The iLab offers this support at favourable tariffs. For young entrepreneurs, Green PAC’s iLab formula is one of the most effective and practical forms of support, says Jan Jager. Another project is about developing and testing materials for 3D printing. Plastic bits for athletes, a practical and useful product, for example for (field) hockey players. Green PAC tests them at a few hockey clubs in the Netherlands. Firstly, the researcher makes a 3D scan of the athlete’s teeth, and feeds the data into a file; from this, a 3D print is made from an elastic polymer. Another line of research is chemical recycling of polyester (PET). Researchers first decompose PET to its monomers glycol and terephthalic acid; together, these produce PET again. The main advantage of this procedure is that the monomers can be purified much easier than the original plastic. This implies that the feedstock does not need to be very pure (the main obstacle in plastics recycling). Moreover, the purified monomers can be handled on existing equipment. Recycling is an area of major interest because the Dutch government recently formulated a policy goal for full-scale national circularity by 2050. Green PAC receives much support from regional authorities, like Drenthe and Overijssel provinces. Emmen is next to the German border, which facilitates cross-border cooperation. This cooperation receives much support from special funds. The cooperation extends far into Germany, to Bremen, Lingen and Osnabrück. Drenthe province is an active participant and has announced its intention to become a launching customer for green polymers – important, as national policy with regards to the biobased economy now slows down. And what plans do you have for the future, I asked Jan Jager. Grow and grow more, he said. There is a world to be conquered out there, for the circular economy, and for biobased and biodegradable polymers.